Big Sky Lodge II is practically a hotel in itself, with seven private bedrooms and sleeping accommodations for up to 28 guests. The property is ideal for large groups traveling together, such as family reunions, sports teams, wedding parties or church outings. A cavernous great room is located on the lodge’s main floor, with leather sofas and armchairs gathered around a traditional stone fireplace and a flat-screen TV. The great room is a comfortable place to unwind and a convenient central location for team meetings or just to be used as a shared social space. The dining room was designed with banquet-style meals in mind, providing enough elbow room for all 28 guests to eat together. Three long tables and a breakfast bar make this another convenient social space for the whole group. The connected kitchen is equipped with ample counterspace and all of the dining and cookware you will need to prepare large meals, as well as modern appliances. There is plenty of space in the kitchen for multiple people to work together to prepare meals. In addition to the usual living spaces, Big Sky Lodge II offers two separate recreation spaces in the form of an upper level game room — complete with a Golden Tee game, a combination Ms. Pac-Man/Galaga arcade console, a Wheel of Fortune pinball machine, a flat-screen TV and a wet bar — and a secondary game room on the lower level with a pool table, air hockey and a card table. The lower level also houses a home theater with an oversized projection screen and cinema-style seating for 12. Sleeping arrangements: Big Sky Lodge II is well equipped to handle the needs of 28 overnight guests with seven private bedrooms and three additional sleeper sofas. The bedrooms are spread out over the home’s three floors with bathrooms shared amongst them. Three master suites on the upper level are furnished with a king-sized bed, a TV and a walk-in bathroom. Two of these also offer private access to the balcony. A fourth bedroom on the main floor is also furnished with a king-sized bed, a TV and a private bathroom with a jetted tub. The last three bedrooms and the remaining bathrooms are located on the lower level, with a set of queen-sized bunk beds in each. These bedrooms also have their own TV. Even with the extra pains taken to accommodate such a large group, with 28 people in one house, guests are sure to walk to spend some time outdoors with the spacious views and the clear mountain air — and Big Sky Lodge II is prepared to meet you with comfort and style when you do. Multi-level decks and balconies arranged on the mountains-facing side of this luxury mountain retreat are furnished with a number of wooden rockers and an outdoor hot tub. The property also boasts a large, private gazebo, with a roof and ceiling fan to provide a cool and shaded outdoor space even on the hottest summer days. Next to the gazebo, guests are welcome to make use of a park-style charcoal grill for a traditional barbecue. 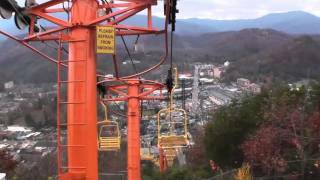 Big Sky Lodge II is located an easy direction from myriad local attractions in Gatlinburg. A number of big-name entertainments are available nearby that may be well-suited to large parties, such as the Ober Gatlinburg Ski Area and Amusement Park — home of downhill skiing, seasonal ice skating, a tree-level trolley ride, a wildlife encounter and the infamous Mountain Coaster — or the Great Smoky Mountains National Park, where visitors can see the sights from atop a mountain lookout point, picnic next to sweeping fields of untouched wildflowers, tour the historic cabin trail, hike or bike the paths to hidden waterfalls, or swim, boat, paddle and fish in the lakes and streams. 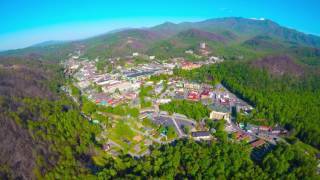 Guests staying at the Big Sky Lodge II may also want to form smaller groups to try and cover all of the smaller attractions in the area — can’t-miss sites like the Guinness World of Records Museum, Ripley’s Aquarium of the Smokies, the Gatlinburg Arts & Crafts Loop, and hundreds of other collections, shows, restaurants and shops. Big Sky Lodge II Requires a two-night minimum stay at a nightly rate of between $238.00 and $1127.00 depending on the needed dates.